This Nativity is made in a workshop near Cape Town, South Africa. 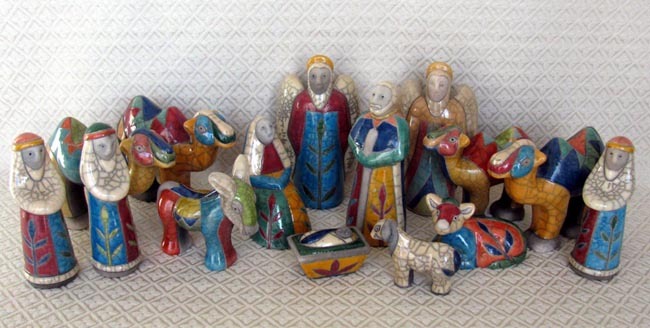 Our other Raku Nativities include exotic African animals, but this version contains the traditional Nativity animals. An interesting feature of this set is the leaf pattern on many of the figures, which is no longer made by the workshop. Even the white sheep has a bright blue leaf on its rear end! The 15 pieces include: Joseph, Mary, Baby Jesus, two angels, three wise men, four camels, a cow, a mule, and a sheep. The Joseph figure measures 6.75 inches tall. Raku Pottery originated in ancient Japan. It is the process of manufacture that gives the pottery the Raku identity. South African Raku is unique as to its bright colors and geometric designs. The fired bisqueware is heated a second time in a kiln to 950 degrees C and then allowed to come in contact with cooler air so the glaze cracks unpredictably. Then the hot pieces are placed in a bed of sawdust. The smoke from the smoldering sawdust then gives these crackles and any unglazed surface their dark coloring. No two pieces are the same, nor are the colors exactly the same.